ACD Sports created the original High School Musical costume line in 2006 and has sold them to theatres, schools, drama clubs and fans around the world! Our high quality, brand new, authentic WILDCATS basketball and cheerleader uniforms that will thrill your audience and cast! We are committed to making sure your costumes are delivered on time for your show. Because we sell the costumes at such a low cost (cheaper than renting in many cases), you can get your costumes in plenty of time to promote your show and make any alterations, without worrying about someone else returning their costumes in time. We have never been late for a show and have shipped costumes all over the world. Just include the date that you need your costumes in the comment section when you place your order. The earlier you order the better, of course! We encourage you to let us know ahead of time if you are planning on placing a cast order by emailing michelle@acdsports.com with the date of your show, an estimate of which outfits you are planning to order and how many, and the date you will be placing your order. And yes, we do ship worldwide! Whether you are ordering for an entire cast or just one jersey, we can get it to you! Many shipping choices are available when you go through the checkout. Always improving, fresh costumes, better fabrics! while keeping true to the East High Wildcats lettering in the movie. Troy & Gabriella wouldn't want it any other way! Here is our original set of costumes, done for Pacific Repertory Theatre in California. They look great and we can help your cast look even better! 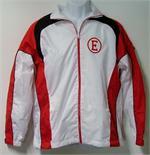 Troy Bolton costume - our new version of his White Warm-Ups that were discontinued by the manufacturer, this mostly white jacket with matching pants includes same lettering & a lower price.